Kristen and Nicholas hosted their close friends and family to an intimate evening with no detail spared. Their ceremony took place on Dripping Springs Wedding Venue. The Las Vegas Strip was their backdrop and the lights did not disappoint. 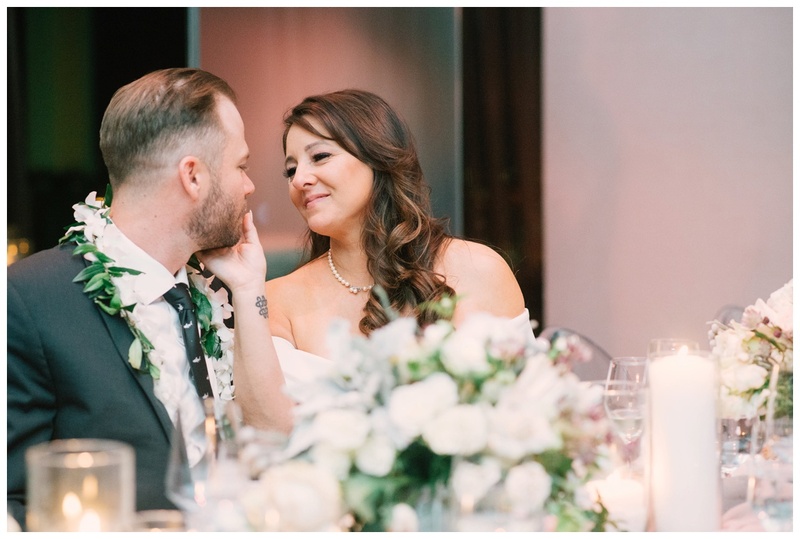 Kristen and Nicholas’ reception was complete with live entertainment, a delicious buffet dinner, wine service, toasts, traditional dances and a surprise video created by Nicholas with the help of their friends and family. 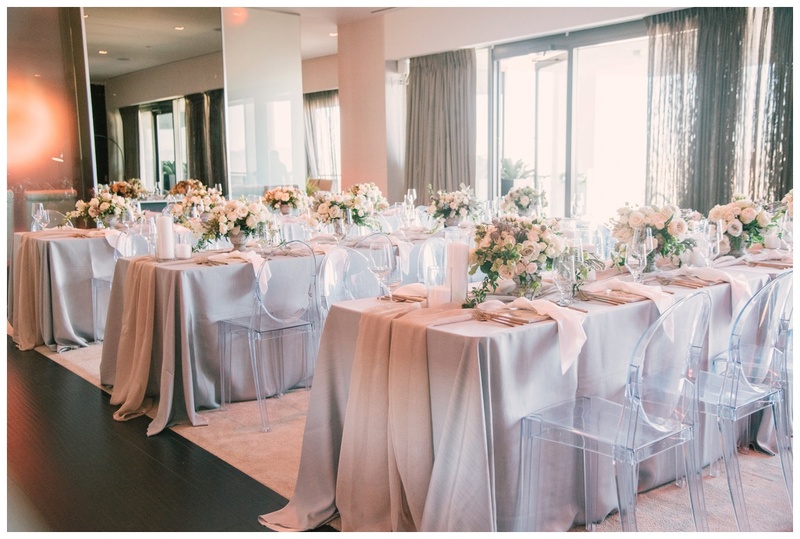 The tablescape was layered with a blush organic runner a top a grey linen surrounded by ghost chairs. 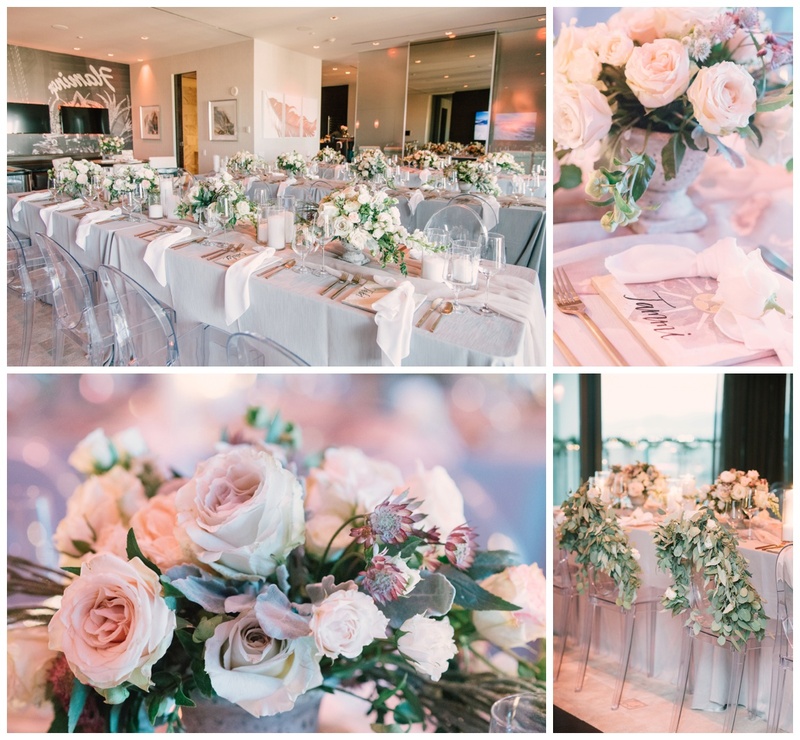 The gorgeous centerpieces include four beautiful arrangements and an assortment of white pillar candles. 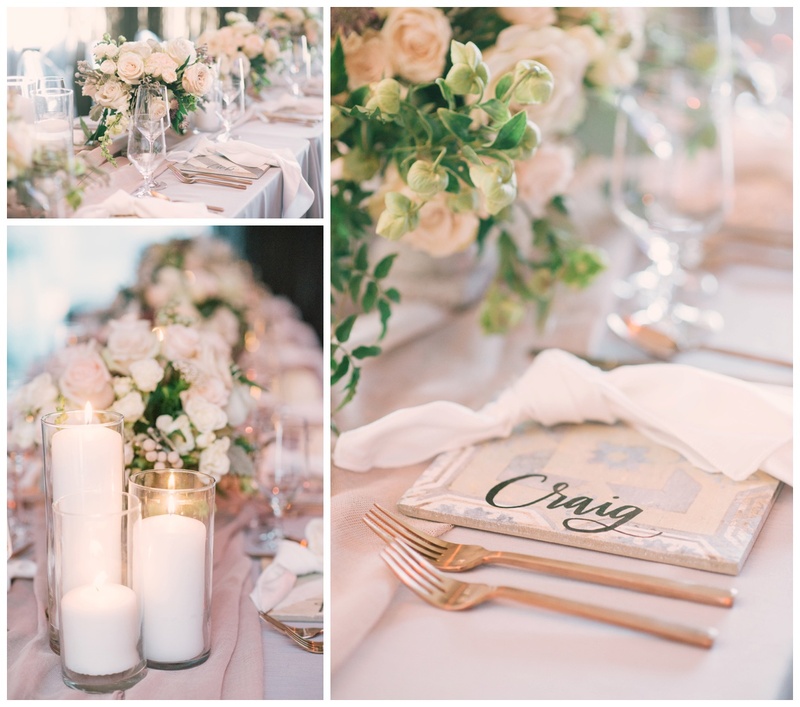 Each place setting had a geometric patterned tile with each guest’s name in calligraphy, a white napkin, white rose with blush ribbon, rose gold flatware and clear crystal glassware! Kristen says “There were so many details I absolutely loved, but I really loved the mini cakes.” Each guest received their own miniature wedding cake to enjoy! My favorite detail of Kristen and Nicholas’ wedding is how their grandparents were so involved with the wedding. Grandparents enjoyed dinner at the head table, grandmother signed the marriage license and grandfathers offered a toast and a blessing. I absolutely loved the sentiment of honoring past generations in such a special way. 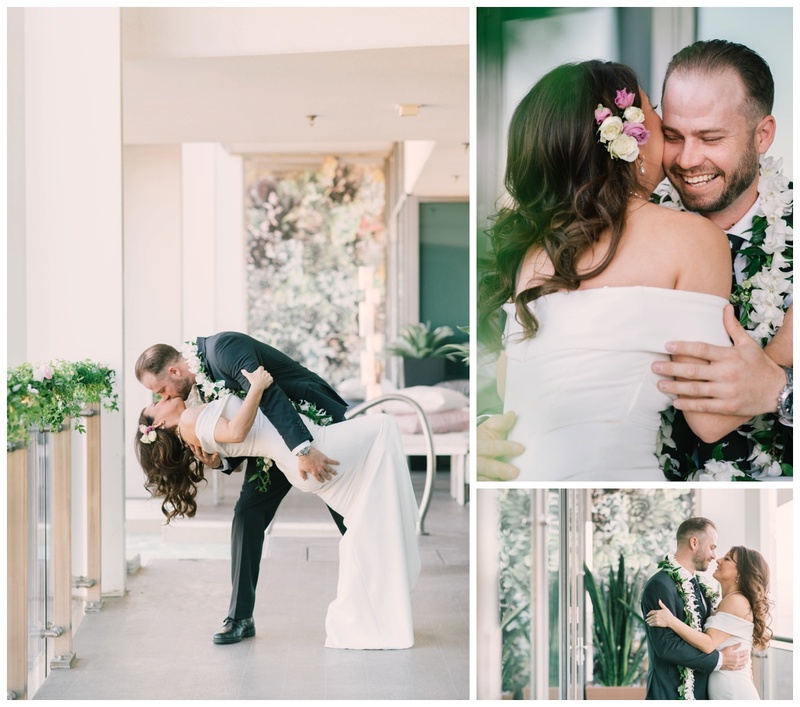 Kristen and Nicholas’ traveled from Hawaii to say their I Dos in Las Vegas and I can now say I have dear friends from the island. Love them and wish them the absolute best. I am thankful for the new mentors in my career who love wine and a good chat as much as I do. I am thankful for Francesca who is extremely loyal and an unbelievable partner in this business. I am thankful for Debbie who has been a blessing to Scheme Events. 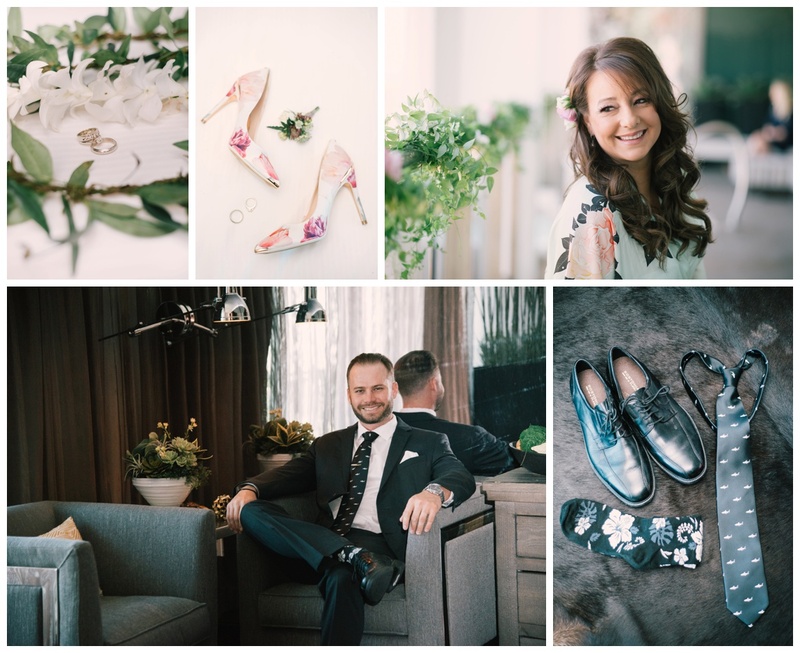 I am thankful for the two beautiful styled shoots I had the opportunity to design and plan this year. I am thankful for FIVE featured weddings! I am thankful for dinner dates with past clients. I am thankful for the five local couples I currently have for 2018, AKA adult interaction. I am thankful for my two precious daughters who remind me that life is about adventures and love. I am thankful for my mother in law who visited during my busy seasons to help manage my life. I am thankful for my husband who pushed me to be the best version of myself. I am thankful for wine. I’m thankful for my iPhone 6 lasting me until Christmas. I am thankful for a grandpa who answers all my questions. I am thankful for my best friend who rarely hears from me but always knows when to check in. I am thankful for the relationships I’ve built through the board of WIPA. I am thankful for my WIPA Membership Committee who helped reach our membership growth goal. I am thankful for Stitch Fix, my personal stylist. I am thankful for the opportunity to refer business to others. I am thankful for my new housekeeper. I am thankful for Amazon Prime and the drivers who have learned not to ring my doorbell during nap time. I am thankful for another day of challenges and celebrations. Be thankful for your blessings! Happy Thanksgiving!